**OPEN FOR VIEWINGS AND VALUATIONS 7-DAYS A WEEK. SATURDAYS 10-4PM AND SUNDAYS 10-2PM** Allen house is one of two substantial four bedroom luxury CUSTOM NEW BUILDS by local building company Apple Green Construction. Allen House is a spacious family home has approximately 1,600 sq. ft of living accommodation - Entrance hall; the generous and open plan lounge/kitchen/family room is situated to the rear of the property with bi-fold doors into the garden - it is a remarkable space for modern living and entertaining; a second reception room offers flexibility for a formal sitting room, child or teenager’s room, study or even an additional bedroom; the quality fitted kitchen area has a lovely range of cream units with oak and quartz work surfaces and has integrated appliances including dishwasher, oven, five ring hob, fridge, freezer, wine fridge and microwave. There is a separate utility room and ground floor shower room. On the first are four bedrooms with the master having an en-suite and family bathroom. The enclosed rear garden is low maintenance with a good sized patio seating area. A block paved driveway provides parking for at least three vehicles. The property is extremely energy efficient with an A rating plus is has added cost saving benefits including a rainwater harvesting system and solar panels. VIEWING IS ESSENTIAL TO FULLY APPRECIATE THE QUALITY OF THE FIXTURES, FITTINGS AND OVERALL FINISH OF THIS PROPERTY which includes Oak veneered doors throughout, luxury bathroom fittings and tiling, Karndean flooring (where specified) Sought after village location with good amenities. **OPEN FOR VIEWINGS AND VALUATIONS 7-DAYS A WEEK. 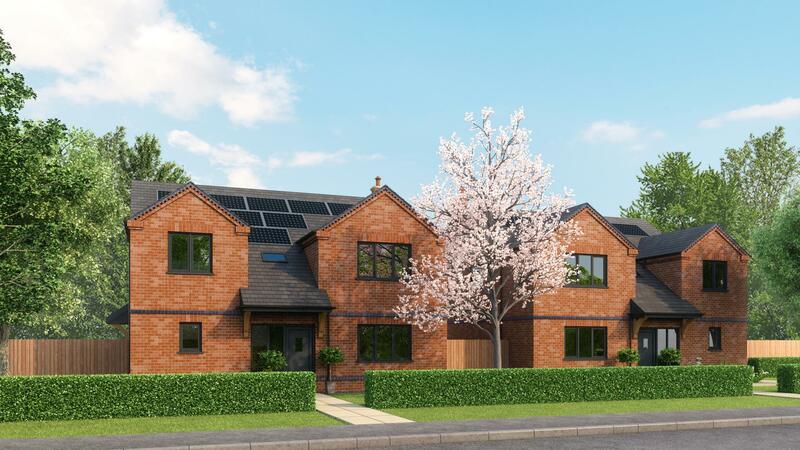 SATURDAYS 10-4PM AND SUNDAYS 10-2PM** Allen House is one of two substantial four bedroom luxury CUSTOM NEW BUILDS by local building company Apple Green Construction. This spacious family home has approximately 1,600 sq. ft of living accommodation - Entrance hall; the generous and open plan lounge/kitchen/family room is situated to the rear of the property with bi-fold doors into the garden - it is a remarkable space for modern living and entertaining; a second reception room offers flexibility for a formal sitting room, child or teenager’s room, study or even an additional bedroom; the quality fitted kitchen area has a lovely range of cream units with oak and quartz work surfaces and has integrated appliances including dishwasher, oven, five ring hob, fridge, freezer, wine fridge and microwave. There is a separate utility room and ground floor shower room. 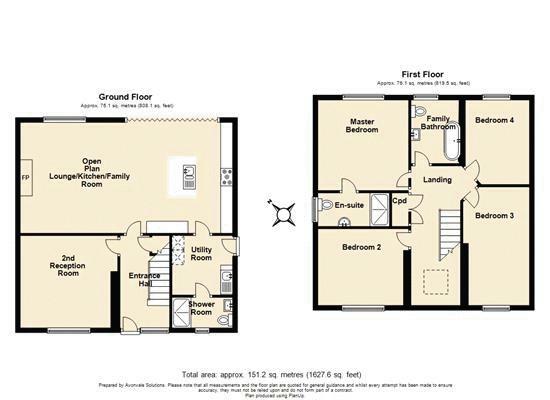 On the first are four bedrooms with the master having an en-suite and family bathroom. The enclosed rear garden is low maintenance with a good sized patio seating area. A block paved driveway provides parking for at least three vehicles. The property is extremely energy efficient with an A rating plus is has added cost saving benefits including a rainwater harvesting system and solar panels. VIEWING IS ESSENTIAL TO FULLY APPRECIATE THE QUALITY OF THE FIXTURES, FITTINGS AND OVERALL FINISH OF THIS PROPERTY which includes Oak veneered doors throughout, luxury bathroom fittings and tiling, Karndean flooring (where specified). Sought after village location with good amenities. Obscure double glazed entrance door with side panels. Stairs rising to the first floor with storage cupboard below. Doors into kitchen/dining/family room and second reception room. Radiator. Double glazed window and bi-folding doors overlooking the rear garden. Under floor heating. Lounge area with chimney breast and inset multi-fuel burning stove. Pendant light fitting and wall lights. Television aerial point. Kitchen area: Fitted with a range of gloss wall and base units surmounted by oak and quartz work surfaces with down lighting and soft close fittings. Central island with storage units and drawers with integrated wine fridge, one and half bowl stainless steel sink with mixer tap (with filter and instant hot water taps) and dishwasher. Main units have integrated appliances including full height fridge and freezer, five ring Lamora gas hob with extractor hood, double oven and grill and microwave. Kitchen area also has a USB connection point. Obscure double glazed door to the side aspect. Range of matching wall and base units surmounted by oak work surface. Plumbing and space for washing machine and tumble dryer. Stainless steel sink and drawer with mixer tap. Wall mounted Baxi gas-fired combination boiler. Heated towel rail. Extractor fan. Obscure double glazed window to the front aspect. Double walk in shower cubicle with mains fed, dual shower heads. Vanity wash hand basin with sensor light mirror above. Low flush w.c. Quality styled splash backs. Karndean flooring, Heated towel rail. Double glazed window to the front aspect. Radiator. Television aerial and broadband points. Velux window to the front of the property. Double fitted storage cupboard (which contains the manifold plumbing system). Radiator. Access into the loft (which insulated, part boarded for storage with light and retractable ladder). Doors leading off. Double glazed window to the rear aspect. Radiator. Television aerial point. USB connection point. Obscure double glazed window to the side aspect. Double walk in shower cubicle with mains fed, dual shower heads. Vanity wash hand basin with mirrored storage cabinet above with lighting. Low flush w.c. Quality tiled splash backs. Heated towel rail. Karndean flooring. Stylish chrome fitted accessories. Down lights to the ceiling with extractor fan. Double glazed window to the front aspect.Radiator. Television aerial point. USB connection point. Double glazed window to the front aspect. Radiator. Television aerial point. USB connection point. Double glazed window th the rear aspect. Radiator. Television aerial point. USB connection point. Obscure double glazed window to the rear aspect. Panelled bath with mains fed mixer/shower head tap. Vanity wash hand basin with touch light mirror above. Low flush w.c. Quality tiled splash backs. Stylish chrome fitted accessories. Karndean flooring. Heated towel rail. Down lights to ceiling with extractor fan. The rear garden is enclosed by wall and fencing with gated access to the parking area. There is good sized patio seating area under which sits a 300 litre tank for the rainwater harvesting system. The garden is low maintenance as has been laid with artificial turf (which could be replaced turf if preferred) with a feature raised bed for planting. To one side of the property is a gravelled area which is ideal for storage. To the other is a further planted area with gates leading to the side street and front of the property. A side access door leads into the utility room plus there is an area with a wooden storage shed. The property will have a 10-year new build warranty.